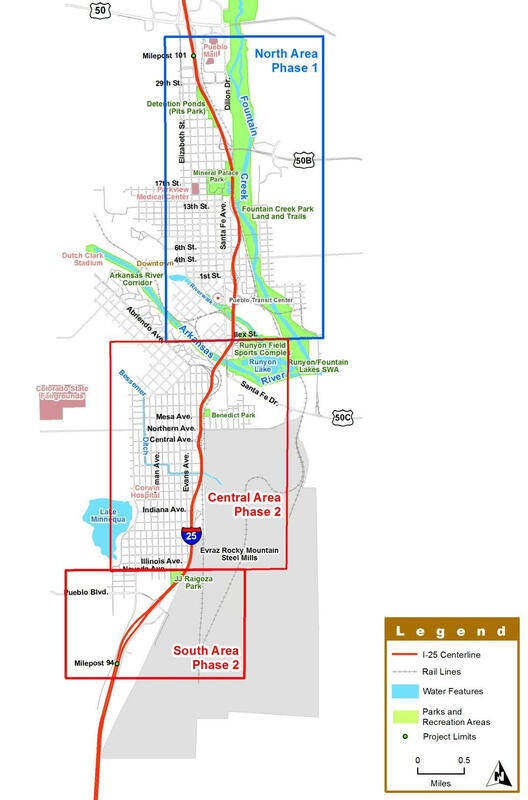 Map of the planned I-25 project, known as the New Pueblo Freeway, from the Introduction in the New Pueblo Freeway Final Environmental Impact Statement. Available at i25pueblo.com. A seven-mile section of I-25 through Pueblo is slated for improvements starting this spring. It’s the first part of a two-phase project called the New Pueblo Freeway. Some 165 people attended a recent public hearing for the project hosted by the Colorado Department of Transportation. KRCC's Shanna Lewis was there and has this report. It’s the oldest segment of interstate highway in Colorado that has not been rebuilt. It was constructed in the 1950s, before current safety standards were created. CDOT project manager Joe DeHeart said the outdated physical design, including narrow shoulders, tight curves, and ramps that are too short or nonexitant, means a higher accident rate. The project plans include widening the highway to six lanes, adding shoulders, and improving interchanges. It’s been thirteen years since CDOT held the first public meetings about the planning process. Most locals see the need, but many are worried about the impact on hundreds of homes, businesses and public places in the construction corridor. Doug Hunter’s used car dealership is near the highway. "Well, ten years ago we were going to be out in two or three years," Hunter said, "and now it’s a decade later and it looks like it's gonna impact us less. But it’s an evolving plan so it’s really hard to say." While loss of properties and increased noise were among the major concerns, Jackie Fisher was one of many who spoke on behalf of a decades-old display of wildlife statuary at the Star Nursery that could be blocked by a noise wall. "People enjoy seeing it on the highway the little kids for generations have waited until they can see the animals. They name them, they name all the animals. It’s a monument for Pueblo." CDOT’S DeHeart said they’ll be able to address concerns like the noise wall as the design-build process takes place. "What we don’t have figured out is the actual design of that," DeHeart said. "The planning document, if you look at it like a percent, we’ve got about five percent of the design in the environmental impact statement so we don’t know exact elevations, we don’t know exact configurations." The design build process calls for the design to occur as funds become available for each segment of the project. Phase one is located between Ilex Avenue and 29th Street. State funds specifically marked for bridge repair and collected through vehicle registrations will pay for work on the Ilex Bridge and interchange. DeHeart says he expects work on the Ilex interchange to begin in the spring, cost about $30 million and take about a year and a half. The total cost of the two-phase project was estimated at $800 million in 2010. CDOT is taking public comments on the project’s final environmental impact statement through October 15. For more information, visit i25pueblo.com. Pueblo residents are invited to a public hearing tonight about some upcoming planned improvements on Interstate 25. KRCC’s Eliza Densmore reports. The Colorado Department of Transportation along with the Federal Highway Administration are hosting the meeting which consists of an information session and an opportunity to ask questions and weigh in on the projects. Planned improvements include fixing deteriorating roadways, widening the highway between 29th and Indiana Avenue, and adding shoulders.